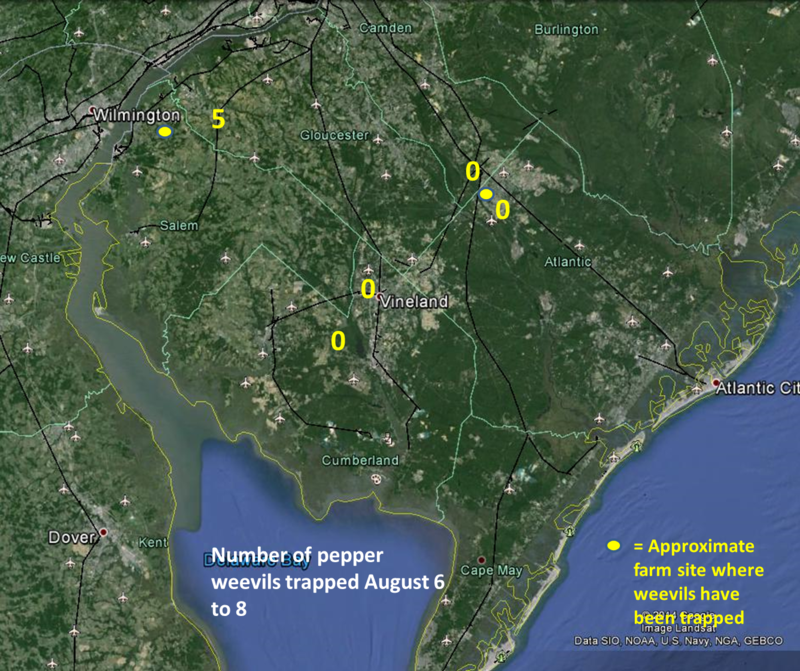 Two light infestations of pepper weevil have been found, one in Oldman’s township and the other in the Hammonton area. In both cases the infestations are relatively small and at this time of season potential yield loss will be less than had the infestations occurred in May or June. 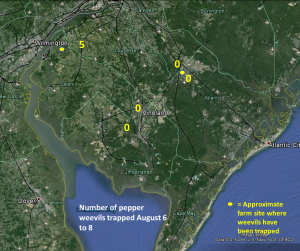 Weevils were also caught at a produce handling facility near Swedesboro. However, the fact that the weevils have resurfaced likely means that there is a field somewhere that was infested early in the season and now the weevils are spreading out. Symptoms of infestation include aborted fruit with grubs or adults inside the fruit, aborted fruit with a small circular hole, and scarcity of fruit on the plants. How aggressive farmers should be in managing the weevils depends in part on market prices and how long the farmer is going to maintain the field. Without any control measures, that is weekly applications of insecticides, yield loss can still be substantial. Florida extension specialists recommend a weekly rotation of Actara with foliar applications of Vydate. Some local farmers have opted to use less expensive materials. Refer to the Commercial Vegetable Production Recommendations for a list of effective materials.